Manual Direct drive servo turntable, rare and very well built classic, if you find one buy it, you would need to spend well over a 1000.00 by todays standards to beat it, and perhaps more, and the real wood base makes it look great, this is a very heavy turntable. I have a mint condition Pioneer PL-71, I brought back in the day, from Crazy Eddie you remember his prices is insane, I'm a person that always took care of my equipment, I even have a Sansui 9090, and Pioneer HPM 100 speakers, Akai Tape deck, reverb all mint condition. OK this is an old deck. Known to be og good quality back in 1975 - 1980 when it was first introduced but perhaps rather overlooked as in the UK we were all Linn LP-12 mad and if a deck was not belt drive in the Linn vein it was not to be considered. So what do you get for around £150 or $230 then (rough 2009 2nd hand price). You get a very well made deck with nice walnut wood finish. Simple non quartz locked Direct Drive that should last for years and years to come. The tonearm is of particularly high quality with carefully chosen bearings and nice features to cater for cartridges of weights from 4 to 32g. VTA is also easily adjustable. If you get a 120V version you can either get a voltage adapter (100w Maplin one for £14.99) or simply move one of the wires to the mains transformer and the job is done (you do have to remove the base cover and be able to solder / know what you are doing to try this). So how does she sound? Well this is quite a revelation. 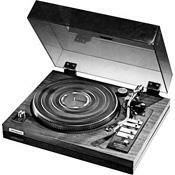 This turntable is right up there with the greats when it comes to music reproduction. It simply surpasses many of the UK cottage industry & other country very hi-end decks and is preferred by several very knowledgeable and musically savvy audiophiles who are vocal about this decks capability on several major hifi fora. The PL-71's ability to create an involving musical insight is 2nd to none. It's timing and lightness / deft touch with music is what is so good. All you need is a good headshell. The Sumiko if you are to use a heavy or low compliance cartridge or a good lightweight one if you are to use a high compliance cartridge. Don't bother with other mats. I have found the Pioneer one to be more pleasing on that fleet of foot musical factor I hold so dear. So grab one if you can - it's a deck that is up there with the best at a very reasonable 2nd hand purchase price. It's old so what can go wrong? Speed fluctuations... Most cases easy to fix for a few £'s. - The on / off and speed change switches are likely to be shot. Replace with 2 x £1.49 part from Maplin. - A handful of Electrolytic caps can be causing problems (not had this on my deck) - Direct replacements of 33uF, 10uF and 100f caps are available from Maplin for pennies. Other than that the motor and arm seem pretty much bullet proof. Great TT, very sensitive tonearm and beatiful looking woodbase. Far better than the average TT you can buy today.